An often heard crede – especially among so called “abolitionist” vegans – is that “veganism is the moral baseline”. It seems to mean that being vegan is the minimum we can do for the animals if we want to be moral creatures. Conversely, anything less than vegan is immoral behaviour. I don’t agree with that, and the way many activists use the sentence often seems quite ineffective and often condescending to me. From idea that veganism is the moral baseline, it seems to follow (at least for those who adhere to the moral baseline motto) that our outreach towards omnivores can never be anything less than suggesting them to go vegan. Asking people to be reducetarians, for instance, would be an immoral demand, just like, believers hold, asking or demanding that a childbeater become a parttime childbeater rather than doing it every day (I have written about that before, here and here). Those who would answer that the morality aspect is the most important, will often claim that the impact is actually on their side too, and that what is painted above is some kind of false dichotomy. I want to briefly examine here if that is true. In other words: is it possible that asking other things than “go vegan” is more effective in reducing animal suffering and killing? People who follow this blog will know that my answer will be that that is definitely possible. I give three reasons why I think a smaller ask may (often) be more effective than the bigger, go vegan ask. I am not implying that everyone should do “reducitarian” outreach – more about that below. It seems to be common sense that when we ask people to do something easy, more of them will do it than when we ask them to do something hard. The difference between the small number of people doing the hard thing, and the higher number of people doing the easy thing is big enough, the people doing the easy thing may all together have a higher total impact. Say we ask one thousand people to go vegan and say we get ten of them to actually do so (it definitely is possible to go vegan overnight, no one is denying that). On the other hand, say that we ask another thousand people (our control group) to participate in Meatless Mondays, and say that 300 do so. You can do the math. One might object that the few people that were convinced become fulltime vegans might also become active in reaching out to others, but actually the same can be said about the meat reducers, who can also advocate for Meatless Monday. I believe our main challenge today is to get as many people as possible to take the first steps, to cross a certain treshold.That is in many cases one of the most important things we can help them do, because it is a lot easier to move up the vegan scale when you have made a first step. Being a reducetarian is not an end, but a beginning. Meat reducers are the driving force behind demand, and companies producing vegan products, do so in the first place for *them* and not for vegans. 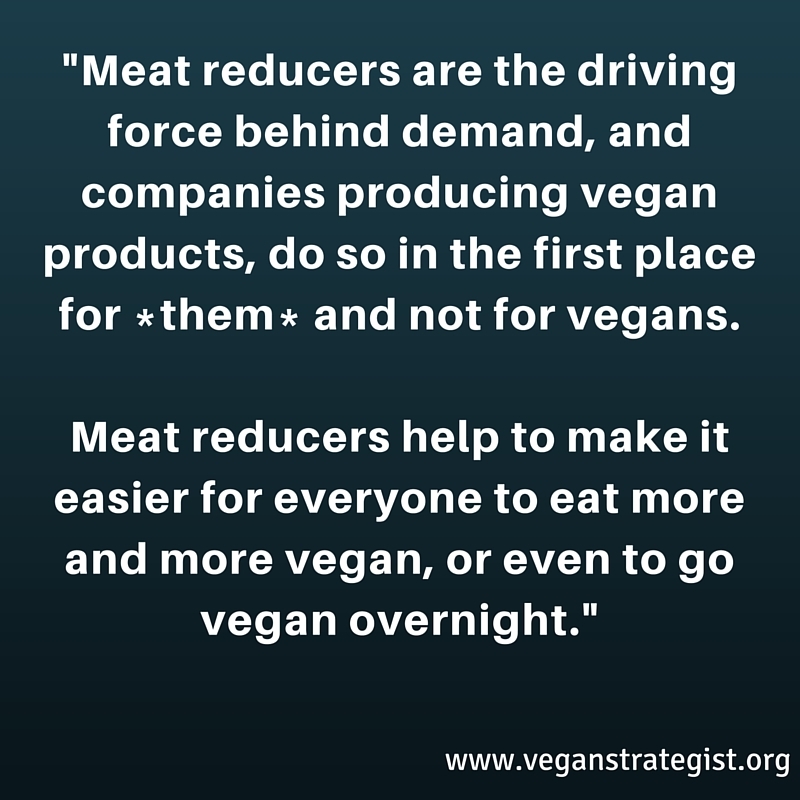 In other words, meat reducers help to make it easier for everyone to eat more and more vegan, or even to go vegan overnight. These are three reasons – and in my upcoming book they will be better referenced – that could indicate that asking people to reduce might have a bigger impact than asking them to go vegan. One could argue that if this would be so, this demand would actually be the more moral one. After all, what’s moral about using a message that is less effective than one we know to be more effective? Let me explicitly state my purpose in writing all this. I am not saying that our movement should never use the “go vegan” message. I *am* saying, conversely, that we are under no moral obligation to *always* use the “go vegan” message. And I am suggesting that those who think they should criticize people who do “less than vegan” outreach (be they vegans themselves or not) stop doing that. < Previous Celebrities: helpful or harmful? I tried to explain that to an abo. They seem to think they are more effective by wasting their time telling everybody that L214 is wrong in its communication by asking less than “go vegan” rather than what L214 is actually achieving. That’s it, I’m getting myself a sandwich board and loud haler so I can stand outside your house, Tobias, and preach vegan fire & brimstone. I have issues with Francione’s style, but look past that. I believe that the criticisms of his approach are based upon less meaningful measures, because those measures, such as “effectiveness” are easier to grasp. (as in the case of the drunk who dropped his keys in the dark alley but looks under the streetlamp because the light is better). If you apply the “effectiveness” measure to other societal evils such as slavery, sexism, racism, antisemitism – they clearly ring hollow. It reminds me of my elementary school days in the 1950’s where the word “tolerance” had the halo – now it is just a sugar-coated way of saying ‘keep your racism to yourself’ – not a society i would aspire to. So, in my opinion, it is possible and consistent to insist that “Go Vegan” IS the only final effective goal and, at the same time respect the flaws, failings and inconsistencies of human nature not to demonize those who don’t immediately “see the light”. I believe it is legit to use the tried and true techniques of persuasion, but deception and disrespect for people’s ability to hear the truth (such as implying that going “meatless” in favor of eggs and dairy is a step in the right direction) is insulting and a misguided approach. It is possible to proclaim, “End Racism Now!” and still understand that there must be programs and approaches to allow people to experience their commonality with other races and to chisel away at historical fears and prejudices. So Go Vegan Now and I will do my best to gently encourage and to help you make the transition. I would love the world to go vegan overnight, Paul, but I don’t feel it’s helpful to expect it or, indeed, demand it. In fact, I’d say very few people go vegan from omnivore: for me it was a process (pescatarian for years, on-off-vegetarian for a few more and then vegan) and I’m sure it’s the same for many more vegans. So I do find it difficult to see how I can ask of others what wasn’t realistic for myself and most other vegans I know. Sure but there is a difference between the message and the expectation. I tried to make the point (obviously unsuccessfully) that despite the desire to end a societal ill, such as racism, there still must be a process and incentives to get people to change ( I called them “programs and approaches”. If I had a bumper sticker saying, ” End Smoking Now”, would I expect smokers to stop immediately? Of course not. But I’m not going to say “Smoke Filtered Cigarettes Now” – to send a message that just perpetuates a habit and feeds the cigarette industry. What I’m saying is that, yes, powers of persuasion must be used, but we have to choose them wisely. “Meatless Monday”, for instance, in my opinion is not wise and does send powerful contradictory messages. I remember agonizing in front of the egg case at the grocery store wondering which “cage free ” or “free range” eggs should I buy to soothe my conscience when, in fact, the whole thing was a marketing ploy, a sham. If instead, the carton contained a flier titled, “Do you know where your eggs come from?” with pictures of male chicks being ground or hens crammed in living coffins, I would have gone vegan much sooner. paul, in case you’re interested, watch the first video presentation on my video page. 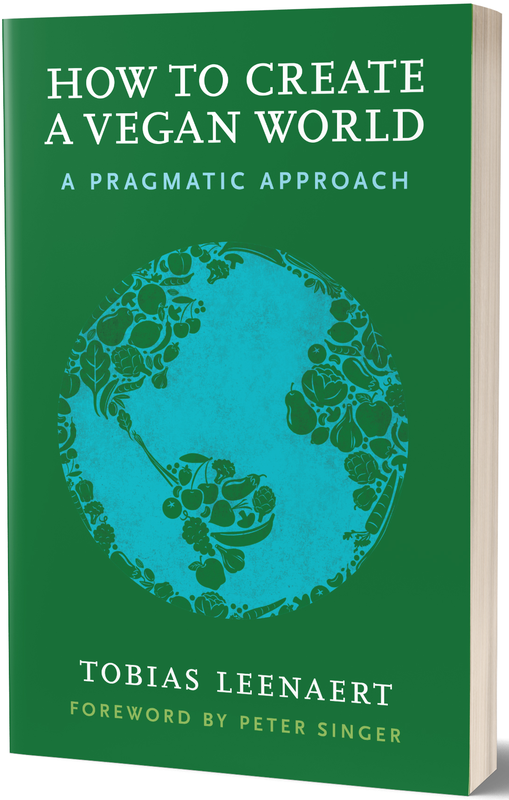 I talk about a strategy where meatless mondays and other reducetarian approaches create a fertile breeding ground and make it easier for people. I think we could do well with a preparatory phase. I totally understand where you’re coming from, Paul, in terms of approaching societal ills with a clear message. And, in relation to free-range eggs, I agree that consumers should be much more aware of what that term means. It’s incredible misleading and deceptive. Your cigarette comparison doesn’t support your argument, however. Quite the opposite, actually: people nowadays are much more likely to move from smoking to vaping, which is very much a transition – vaping still involves nictoine consumption, albeit much less harmful than smoking. And doctors prescribe nicotine patches, don’t they? You made the point earlier that Meatfree Mondays and other reducetarian campaigns disrespect the intelligence of the people you try to engage with such and, again, I believe it’s quite the opposite: if a vegan suggests to a non-vegan friend that they try cutting out poultry or Meatless Mondays or, indeed, what The Vegan Society suggest with their Go Vegan for a Month initiative (https://www.vegansociety.com/try-vegan/take-vegan-pledge), I think it’s going to be obvious to the non-vegan friend that the preferred long-term outcome is full-time veganism. But does encouraging small steps negate that? I really don’t think so. I worked in training for a good part of my life and one of the fundamental principles for good delivery of such is to meet the person where they are at. For me, Meatfree Mondays and One Step and other Reducetarian strategies are effective ways of meeting people where they are at. They’re part of the solution, not part of the problem. I appreciate your work and I am in need of it, I have been using quite ineffective methods. Although the knowledge doesn’t bring forward the behavior. I occasionally fall into an emotional state which bypasses my logic and makes me say harmful things to nice people, e.g. ‘You are inconsistent and therefor immoral’. This obviously makes them dislike me and, worse, creates a prejudice towards all vegans – since, pretty much always, I am the only vegan they know. From what I have read (here and elsewhere) I understand you have had trouble with losing yourself in negative emotions, any advice on how to address this? Do you know when your book will be finished and published? Please keep in mind that these issues affect all people across the board who are involved in all kinds of work, not just animal activists/vegans. Whoops, sorry to take up so much space in the comments, Tobias. I didn’t realize the links I included would actually bring up the videos here. Regarding negative emotions: most of us are prone to them. what helps me most is trying to see something good in something that i think was negative. it’s a matter of chosing what to focus on. It also helps me to see people as basically good, but just human, and learning. Like children. For instance, put “non-smoker” in the blank. It’s very important to also remember that a big part of the equation is also knowing & understanding what “common sense” actually means in the minds of the people we are asking to do something. For instance, it makes no sense to someone who has never skied before to ski down a black diamond run at 60 mph. To an Olympic skier who has skied down that hill hundreds of times, it makes perfect sense. If we wish to see tangible change, we need to keep in mind what makes sense to the people we wish to change…not what makes sense to us. I understand that this is an extremely anti-abolitionist forum but setting the specific abolitionist philosophy aside, it is clear to me that their “strategy” is to tap into what they believe is a basic human instinct – compassion. People have funny ways of twisting and distorting compassion for sure. A farmer can cuddle his cat one minute and murder the calf in the barn the next. But most people have an immutable part of their nature – to empathize. So the “common sense” that I see is just that – it is common to most humans. What the abolitionist approach attempts to do is to first, make that innate instinct, that “common sense” visible to a non-vegan. Let them experience and recognize that compassion within themselves in a non-confrontational way. The tricky part, the often unsuccessful part is to hope that our 2nd basic human instinct, the craving for consistency, will take over. Cognitive dissonance can be extremely disconcerting for people and leads to anger, dismissal, denial and anxiety. But we all have to go through this in one way or another to get from non-vegan to vegan. If we deprive people of this hard work because we are afraid to offend, I believe we are not teachers in the true sense of the word. It makes the point that we’re all abolitionists, I guess, in that we all want to see an end to animal agriculture. I suppose the differences lie in how we think that is best achieved. Yes, thanks for the clarification. I can see now that, in some part, this is a matter of semantics. I don’t say that to diminish the discussion but to point out that it is easy for the language, like “abolitionism” to have its meaning diluted or redirected from from one meaning to another. Makes it hard to communicate. Regarding Gary Francione (which I believe is a subtext here), the man is brilliant and a pioneer. He has horrible social skills (but maybe because I grew up around New Yorkers I can see past his Chicago hubris:-) He also should be given his due for, if not inventing, at least resurrecting the concept of abolitionism with regard to animals. I believe abolition was coined purposefully to mean “hard line” in the sense of John Brown and slavery. (Go to the museum in Harpers Ferry and see how history regards him. Read the Wiki discussion about him – some haunting echoes to the discussion here.) Francione is John Brown without the violence. He is, from what I can see, an anarchist who has distain for institutions. Maybe he had his ego bruised over the years when groups shunned his message – I don’t know. So his “strategy” is one-on-one – if there are to be baby steps, they should be personally determined, not spoon fed. I personally didn’t take any baby steps to veganism – it was instantaneous after I discovered what I was doing to myself by eating animal products. To be honest, I probably would not have been very receptive to Francione’s message 3 years ago (I am not an “animal person”- like them to be happily in the forest). I needed that period to digest the flood of information out there to firm up my own self-consistent philosophy. Is it just a matter of taste? Do some people need the facts first to in order to change and other’s need to put on the costume first and then play the role (Meatless Monday)? I’m still working on that answer for myself. I do see people who are constantly toying with going vegan and love to attend light social vegan meetups where conversation is just so polite, but they just continue to toy and toy with it. Seems like others have different experiences. I see nothing particularly abolitionist-approachy to what you say here Paul. Any vegan/activist could choose for that. My main issues with the ab approach and followers is that it’s all theory and few practice, and especially that they accuse almost everyone and every org that does it differently as wrong. Plus GLF is obviously extremely nasty to almost everyone but his most devoted followers. I don’t have a problem with the ethical theory in itself, but it’s only that: a theory. It’s much harder to develop something that actually works in practice. Seems I’m in the minority here. I am open to other’s experiences but I don’t want my point to be misinterpreted. We all found individual ways to ultimately go vegan. I may be naive but I believe a critical ingredient no matter what path one takes is being provided with as much information and supporting reasoning as possible. I was vegetarian for many years and had no clue regarding the actual everyday treatment of animals. I was also not exposed to some of the fundamental concepts of “why animals matter?” I felt I was just doing my part by being as conscientious as possible, totally oblivious to the bigger picture. If I had known then what I know now, I would not have wasted all those years continuing to torture animals, my health and the planet. It is subtle (and I don’t believe it is addressed here) but messages and activities don’t stand alone but exist in a context. That context can, on a subliminal level, be much more powerful than the literal message. “Meatless Monday” tells me its perfectly acceptable to eat meat Tuesday through Sunday. Of course it doesn’t say that explicitly – but the real and hopefully unintended message is loud and clear. As for the comment regarding vaping – I don’t know the health risks of vaping but if it is dangerous to the the “vaper” and others in the vicinity, a “stop vaping now!” bumper sticker would seem fine with me. The point is we unequivocally know that eating animals is wrong, morally, health wise, and environmentally. To hide that in order to “trick” the unsuspecting to go vegan, is to throw away a critical element of persuasion. If you want to introduce people on an interim basis to vegan food through potlucks, that’s great. The statement “I believe you should seriously consider going vegan and I suggest you try it to see how easy and satisfying is” is perfectly fine. But to pat people on the back for going meatless one day a week without any context just seems disingenuous – its a web that I don’t want to weave. even if you think that meatless mondays says that or is interpreted as eating meat on other days is ok, and even if you find that problematic, the fact is that even if all of us vegans “unequivocally” say that eating meat is always wrong and give very clear message, it won’t mean a thing. not at this point. my view is that we should keep that communication strategy for in x years, when there are more of us and when it has become easier still. I’m not sure why you flatly say, “it won’t mean a thing…at this point”. I believe providing the “moral” basis for veganism can make the difference for many. If you believe that people will be turned off to a concept that is associated with morality, I don’t see the basis for that. A person who has an anti-moral bias is probably not a candidate for veganism anyway. As I hoped to convey, I don’t have a problem with offering people “samples” of the vegan lifestyle, but I do object to leaving out the compelling underlying message. I could be on board with a vendor, such as Whole Foods Market, offering a free discount on any completely vegan purchases (although I find WF to be pretentious and repulsive given its CEO’s claim to be a vegan – capitalism raises its ugly amoral head) But using the term “meatless” clearly leaves eggs and dairy on the table – is that what the communication strategy wants to convey? Do you think going vegan is hard? I don’t think anybody is saying to just pat people on the back for going meatless one day a week and simply leaving it at that. I agree that providing context is a critical element of the persuasion. The real issue is HOW we choose to present that context and how that can make a world of difference. How we choose to present & frame the context can provide support & motivation for further change, or it can do the exact opposite. Also very importantly, it can damage progress that’s already been made. It’s not good to damage the chances of something we’d like to see happening in the future, but it’s even worse to damage tangible results that have already happened. A person who has decided to try or is already practicing Meatless Mondays is tangibly on their way to hopefully becoming the person we’d like to see: a vegan. Providing a pat on the back to that person along with additional context presented in a respectful and supportive way can help lead them to move on to Meatless Tuesdays, then Wednesdays, etc. Providing that context in a way that is perceived to be negative & condescending, such as insinuating a person is bad or wrong for taking “only” the Meatless Monday step, is probably only going to hurt any chances of that person moving on in their meatless journey. If the person is left with enough of a negative feeling, they may even decide to reverse their Meatless Monday choice. So, in many ways it’s not about “tricking” non-vegans…it’s about tricking ourselves. We need to trick ourselves into learning how to speak the truth that we know & makes us want to scream, but learning how to present that truth in ways that are positive and supportive. Yes, all of us vegans here know that not eating animals one day of the week but continuing to eat them the other six days is wrong. But how we choose to present that context of wrong can either help or harm the chances of creating a more humane world for the animals. It is a fine line, I agree. No one likes to be told they are immoral and to do so would be counterproductive ( I guess it does work for religion though….). The idea is to leverage a person’s innate goodness so they can see that going vegan is moral from their own perspective. The dilemma is that in our culture, most of us are trained from infancy to be blind to the immorality of exploiting animals – how do we reverse that intrenched denial? If people don’t understand the immorality of a certain behavior, how can they possibly use their built-in compassion to change themselves? Look at the TV show, Mad Men – how women were subject to incredibly demeaning treatment – the men didn’t know – until the consciousness raising of the 1970’s. Women learned to refer to some men as “sexist pigs” – pretty insulting but men did change in spite of that very “frank” language. I think a person is actually “good” for taking a Meatless Monday step – the “bad” I see is when that becomes a corporate gimmick that carries with it no additional guidance and may actually turn that person towards dairy and eggs due to the very nebulous title. Some people don’t consider fish to be meat, believe it or not. Apparently the egg industry is booming under the protection of the “cage free” stamp of approval and the decline in “red” meat in favor of eggs and dairy and fish. Animals are no better off – only consciences are soothed. I sure don’t have all the answers and I hope to learn the “trick” of presenting the truth in a way that it will be accepted. Each situation is different. My approach is to proudly display my veganism, bumper sticker, t-shirt, etc and set an example to others. If they ask, I’m glad to answer questions. On the other hand, I have no problem getting in the face of a corporation or big advocacy organization if veganism is used as a ploy to for their own benefit. Interesting perspective on the difficulty of “going” versus “being” vegan. Some people are so hamstrung by social pressures that going vegan will never happen for them due to that personal weakness. I believe a large majority of non-vegans fear the loss of health and one of the few pleasures they have in life. Education can take care of the former and good vegan potlucks can handle the latter. Institutionalizing vegan transition “programs”, in my opinion, sends the message that people need help making this “difficult” change in their lives – like weight-loss or smoking cessation. Once people understand that they will not be “deprived”, the basis for the resistance disappears. Adding the moral message can be the tipping point. I was never vegan, and I will never be vegan. But I did consume a “plant-based” diet for years (i.e., vegan diet but with honey and didn’t avoid byproducts) and even this was a major burden, unless I was at home it was frequently difficult to find something that was healthy, hearty and plant-based. Overtime I burnt out and lost too much weight and I thought, what am I doing this for? What does me being this strict achieve? I didn’t have a good answer…..so I switched strategies and allowed fallback foods which for me is usually dairy but at times select seafood. The switch had absolutely nothing to do with social pressure, but rather the difficulty of finding healthy, hearty and plant-based meals in a society that generally doesn’t not eat healthy or plant-based. Even hearty meals were hard to find, I suspect that at most restaurants the plant-based dishes are targeted towards women trying to eat “healthy” and not 6’2″ active men. I also find that vegan food culture is pretty much a disaster, a good deal of it is focused on peculiar dietary practices (e.g., very low-fat, raw, fruit-based, gluten-free, etc), a good deal of it uses unfamiliar ingredient unnecessarily, a good deal is low-calorie “health” food, a lot of it is low-protein (because protein is so bad! ), etc….once you get past all that there isn’t much left. As such I think many people feel deprived by vegan diets. I am confused and wonder how can your experience be so vastly different and negative than mine? Unless you dislike all of the dozens and dozens of incredibly protein-dense plants which can have as much or more protein than meat ( beans, wheat, seitan, oatmeal, pasta, smoothies, coconut “ice creams”, tofu and all soy products, etc, etc,) I can’t understand how you can possibly be protein-deprived. Its physically impossible. Have you read any of the vegan body building books and websites? These are specimens of exquisite vegan athletes – see for instance, Rich Roll’s website and podcasts. On the other hand it is incredibly easy to be unhealthy on a vegan diet, to gain too much weight – purely based upon the math – too many calories and foods lacking in nutrients. I’m wondering if you have restricted yourself to a limited number of information resources that just happen to be wrong. Where did the idea that protein, per se, is “bad” come from? Yes, too much protein, like to too much of anything is unhealthy, and if you believe the scientific literature, meat protein is problematic in terms of long-term health. In your case, rather than guessing, determine how much protein you need in a day for your lifestyle, 70gm? 120gm?, and then look up the protein content of a black bean burrito, bowl of oatmeal, a cup of brown rice, a few cups of soy milk etc. The numbers add up so quickly. You may be living in a food desert in a more rural area if you can’t find, for instance, an Italian restaurant that will make a pizza loaded with vegetables or a frozen veggie pizza you can make at home. If people “feel deprived by vegan diets” that deprivation is purely self-imposed. I am overwhelmed with the vegan options out there. It may be that you are just a meat and potatoes kind of person and not open to the vast numbers of alternatives. Unless you are just playing devil’s advocate, you clearly went plant-based as opposed to vegan. I wonder what that reason was and why the adamance against veganism? I am curious as to where you get your information and what the food scene is like in your area. I could understand your conclusions if it weren’t for the fact that your experience with the availability of nutritious and super satisfying vegan food is so different than mine and the dozens of vegans I interact with. Why do you think this is? I didn’t discuss protein or being “protein-deprived” so I’m not sure why you made that the focus of your reply. I’m perfectly aware of how to obtain sufficient protein from plants and still obtain the vast majority of my protein from plant sources, but this isn’t what I was discussing. I was discussing the lack of healthy, hearty and plant-based options in the market place. You mentioned a pizza with just vegetables as an example, that isn’t something I would typically eat because its an unbalanced meal. Its just white bread and some vegetables. While I’m not bothered by occasionally eating an unhealthy and/or unbalanced meal, I found that this happened too often and as such eating a plant-based diet (and by extension a vegan diet) became a burden and source of frustration. And for what exactly? I couldn’t think of any good reason to continue to be so strict with matters so, as I said in my post, I decided to rely on fall-back foods when healthy, hearty plant-based options weren’t available. This isn’t about me being a “meat and potatoes person”, I didn’t even grow up eating a lot of meat, or not being open to plant-based foods….its about the lack of healthy, hearty and plant-based options in the market place. And, yes, as I pointed out in my post I was never vegan and I’m talking about a “plant-based” diet which I’d define as a vegan diet + honey + small amounts of byproducts. But such a diet is easier to follow so my experience would have only been worse on a vegan diet (and still worse being entirely vegan). And I really don’t think my experience is anomalous at all, most people that “go vegan” end up as ex-vegans and many cite similar issues. Why would my experiences differ? I think, for one, being vegan wasn’t part of my identity and as such there was no social influence from the vegan community. I’m not sure what you’re confused about, I was just providing a definition for how I was using the term “plant-based diet”. By the “market place”, I mean all the stores, businesses, etc that you exchange your money for goods at. I’m not sure the relevance of “plants have all the critical nutrients that animal products lack”, people aren’t eating meat only diets and the claim is, in fact, not accurate. For example, I take a B-12 supplement because plants lack the nutrient and I don’t get anywhere near enough from animal products. In any case, you still seem to be skipping the actual issue I’m reporting here. My issue was that it was often difficult to find meals that are healthy, hearty and vegan (or plant-based) so I often found myself making compromises which overtime just became more and more a burden as we had less and less time to cook. The issue wasn’t a lack of information on how to make plant-based dishes but rather the sort of options that are typically available at restaurants, grocery stores, etc. The point of a fallback food isn’t nutritional but rather practical, when there aren’t readily available options that are healthy, hearty and plant-based I will eat something that may have some animal products. The vast majority of the time its dairy. There is a bit more to the shift involving my wife getting pregnant than this, but this was the primarily issue for myself. I’m perfectly comfortable with this choice and I find that veganism is based on a mirage of a “cruelty-free” lifestyle. The impact humans have on animals is profound and extends well beyond their use in our food system, the dividing lines created by vegans are inconsequential. Lastly I disagree about PCRM and Forks over Knives, these resources emphasize a low-fat entirely whole foods based plant-based diet which make it much harder to adhere to a plant-based diet for what seems like no good reason. This is part of the issue I mentioned in my first comment, a lot of vegan food and recipes are based on strict dietary regimes rather than standard health recommendations. Vegan is the moral baseline, not an arbitrary line. We don’t need to tell people what to do, we just need to provide information and perspective. It’s always best to let others decide how to proceed. I understand that even by setting absolute vegan as the goal, people will make their own choices regardless of what we say. They will, by default, transition in their own time, in their own way. We don’t need to micromanage that, nor do we need to tell them to reduce. That creates ‘excusitarians’ or ‘flexitarins.’ For example, if you’re sitting next to someone who’s smoking cigarettes and the noxious smoke is bothering you. You want the person to stop, not just cut back. And now, there are so very many plant-based options for animal products, there’s far less valid excuses.